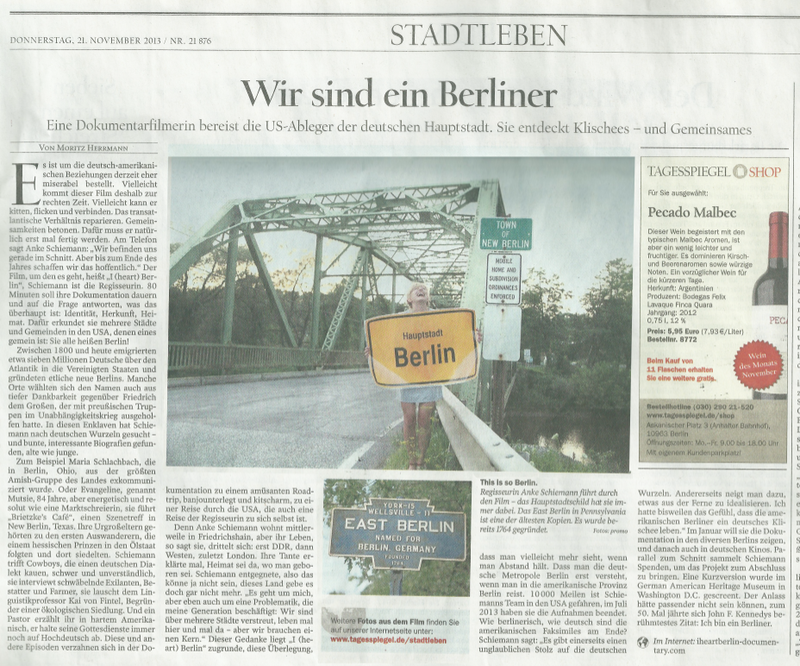 I (HEART) BERLIN in the Berlin daily Tagesspiegel! We mentioned a while ago that our director got interviewed by the Berlin daily. We finally made it in the Tagesspiegel! Please read Moritz Herrmanns article about our documentary I (HEART) BERLIN. A BIG THANK YOU video message to all our supporters! Check out below the latest video message by our director Anke. A BIG THANK YOU TO ALL OUR SUPPORTERS FOR THEIR DONATIONS SO FAR. You guys are fantastic! Keep donating and spreading the word. Together we can finish this film! We are an international team of filmmakers and have been working on the feature-length documentary “I (HEART) BERLIN” for almost 3 years. We finally finished shooting our film this summer. Our film took us to 14 different Berlins all over the USA from the largest Amish community in the States, Berlin Ohio, to New Berlin Texas. We met the most amazing people on our journey: cowboys, linguistic professors, fighter jet pilot instructors, dairy farmers, speech writers, funeral home owners and many more. All having one thing in common: German roots. “I (HEART) BERLIN” is a road trip from Berlin, Germany taking us on a journey through the Berlins of the USA. A journey into the past of the German descendant in the US as well as exploration of the concept of identity, cultural-historical roots in today’s Germany, Europe and America itself. Which is more important where you are or where you are from? Do you leave your history behind and start a new life in an unknown, foreign country? View the trailer for our documentary here! 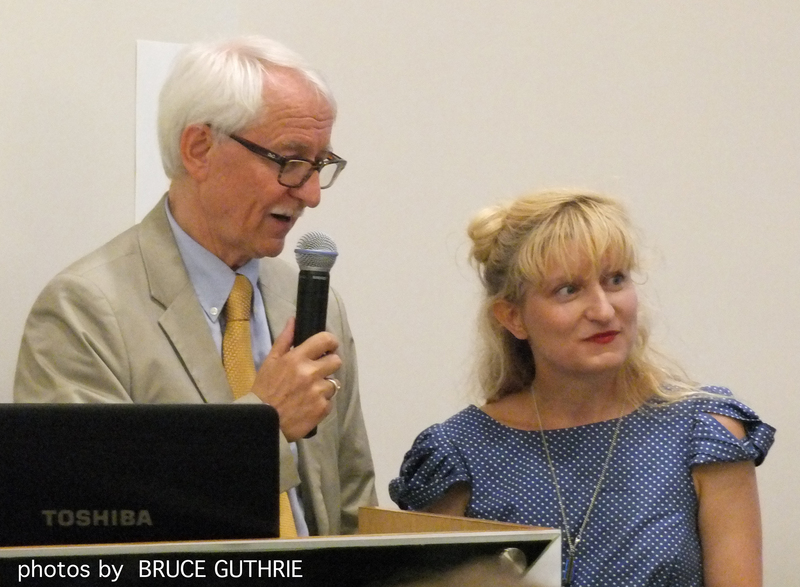 We have shown a short version of our film at the opening of the exhibition “Berlins –Made in the USA” at the German American Heritage Museum in Washington DC this summer, on the day of the 50th anniversary of JFKs speech “Ich bin ein Berliner”. Plenty of Berliners from all over the US participated in the event which we covered to be part of our final documentary. ( below in the pictures you see the director of the museum Rüdiger Lentz introducing the film together with the director of “I (HEART) BERLIN”. Starting and ending in Berlin, the capital of Germany, the story is told through personal stories of German descendants and German migrants. Those portraits will be intercut with the director’s own personal story of migration, dislocation and re-location. We meet Maria Schlablach, an Amish lady from Berlin Ohio (the largest Amish community in the USA), who was excommunicated from her community 2 years ago and gives very interesting insights about daily Amish life and the old myth of “Rummspringerl”. In Berlin Georgia we meet Inge Fischer. She flew Eastern Berlin the night of Stalin’s death after being locked up for anti-establishment comments and migrated to the USA on one of the first Jet planes. We then meet Stewart Saylor from the Historical Society in Berlin Somerset. His ancestors arrived on a ship in 1749 and belong to the first wave of German migrants to Pennsylvania. Stewart got his family DNA analysed and can track back his German heritage to the Lichtenstein cave in the Harz mountains 3000 years ago. We will be having a “bottomless cup coffee” for 75 cent at Brietzke’s Café. This institution of a diner is owned by Evangeline otherwise known as Mutsie for everybody in the neighbourhood of New Berlin Texas. In the early 1840s five sovereign princes and sixteen noblemen from Hessia, Germany, formed an organisation, the Adelsverein, with a very ambitious plan to establish German settlements in Texas. Mutsie’s great grandparents migrated to Texas with the Hessian Princes. In Berlin Massachusetts on of the oldest Berlins in the USA I meet Kai von Fintel. Kai spent 10 years of his life planning and building an eco-village in Berlin. Kai is also a professor for linguistics at MIT. Kai represents my most recent migrant on the trip. Kai only came over to the USA 20 years ago. 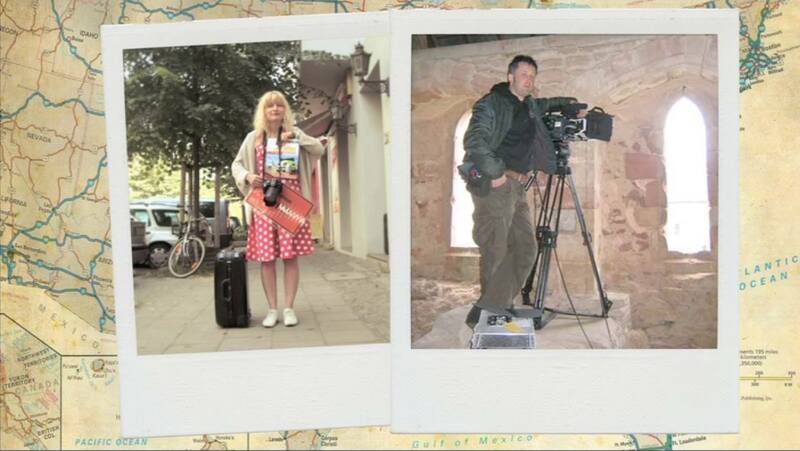 …Of course there are plenty more Berliners featured in our film. Tell us YOUR stories! Be part of I (HEART) BERLIN! Support our project on Indiegogo! We have just launched a crowdfunding campaign on the fundraising platform Indiegogo. We would very much appreciate also your help and your support! All donations will bet rewarded with plenty of goodies, from posters, special edition DVDs of our documentary, T-Shirts, you name it. Only this week Klaus Wowereit, the governing mayor of Berlin Germany, signed three beautiful large prints which are up for grabs as well! For the US Berlin communities, we set up a special screening package. We are planning to tour the US Berlins we are featuring, arrange screenings and be present if money allows. Our aim is still to complete the film by the end of the year 2013. Help us make this happen!